New technologies such as GIS mapping are helping to drive the oil and gas boom forward, providing a greater level of visibility and detail that lets companies make more informed decisions. However, in order to fully take advantage of the possibilities offered by these new technologies, companies need to make sure that they are providing an easy way for their employees to access the maps, documents and information they need. This problem is especially challenging in the case of new employees. When employees join a project from outside the company, or move over from another department within the same company, they often find themselves having to start from square one. While other employees can find information from past e-mails or coworkers they know are familiar with the project, new employees don’t have this luxury. Instead, they often find themselves having to sift through massive archives of maps and other documents trying to find the information they need. This process is inefficient and time-consuming, and it can even cause a project to grind to a halt. What oil and gas companies need to combat this problem is greater organization and centralization of project assets. Fortunately, some land surveying companies provide project management solutions that help make the process of managing and organizing project assets a simple and ingrained part of a company’s everyday operations. This helps ensure that employees and authorized subcontractors will always have access to all the documents they need to do their jobs well. In turn, this will help significantly reduce the time it takes for new employees to go from uninformed to contributing members of the team. Perhaps one of the greatest benefits offered by cloud based project management solutions offered by a land survey company is that they can provide the only information and documentation portal that a company could ever need for a specific project. In the past, important documents might have been stored in different locations throughout a company. This meant that a new employee would often have no idea where to start looking to find the documents they needed. They would have to waste their own valuable time, as well as their colleagues’ time, tracking down those documents. Worst of all, since there was no single repository to cover the entire project, different employees might end up working with different versions of the same document, which could lead to confusion and miscommunication. Project management solutions provide the single document repository oil and gas teams need to keep everyone on the same page. In addition, this one central repository can also be accessed from anywhere, meaning that employees can always access the documents they need, even if they need to do so using a tablet or smartphone while working in the field. To ensure the level of easy access to information and documents that new employees need in order to get up to speed quickly, project assets can’t be stored on internal company networks that have special access requirements. This creates another challenge, as companies still need to be certain that their sensitive data is secure. A project management platform can provide the balance between security and openness, allowing companies to store assets off their network for easy access, while also relying on the dedicated data security of a third-party partner–the land survey company. This means that new employees will always be able to access the assets they need, without exposing the company to risk. Contact us today to learn more about how out how a land survey company can make project management easier. If you want to get started with Landpoint’s cloud-based project site, you can sign up here. As the oil and gas boom continues, projects are increasing in scope, size and complexity. Companies often find themselves unable to adjust to the new realities of their project, leading to bottlenecks that can cause extending delays and wasted resources. In order to remove these bottlenecks and keep your oil and gas projects progressing according to plan, you need to work with an experienced land surveying company that you can trust to provide scalability, rapid access to deliverables, and open lines of communication between key project stakeholders, no matter where they are in the country. One of the byproducts of the oil and gas boom has been a proliferation of new land surveying companies across the country. These new companies come in many different sizes and experience levels, and choosing to work with the wrong land surveying company can have grave consequences for your oil and gas project. Working with the right land surveying partner can help you address these issues, ensuring that bottlenecks won’t occur with your project. In the context of land surveying, “scalability” refers to a company’s ability to keep up with rapid changes in product scope. Scalability is frequently an issue in the oil and gas industry, as new obstacles and complexity arise frequently as these projects progress. Oil and gas companies simply can’t afford the long turnaround times that occur when a land surveyor can’t complete field work and produce deliverables quickly. It’s also important that these companies assess a land surveying company’s ability to scale before the project begins; having to replace a land surveyor that can’t scale will only delay the project even further. It’s a better idea to do your homework beforehand, and make sure you’re working with the right land surveyor right from the start. A land surveying company can ensure scalability by having a large team of experts and the latest technology. When change in project scope creates the need to have more surveyors in the field, a larger company that has experienced teams spread out across the country can easily make that happen, ensuring that the project can continue with no major delays. On the other hand, smaller land surveying companies often lack the resources needed to respond quickly to changes in project scope. If they need more surveying teams in the field, it may take them weeks to get those teams lined up, if they are able to do at all. Today’s industries are more spread out than ever before, and oil and gas is no exception. Key stakeholders from the same project can often be stationed at different locations throughout the country, making it difficult for everyone to be on the same page. As project scope changes, this problem only gets worse. Oil and gas companies need to work with a land surveyor who can provide the ability to distribute information quickly across dispersed geographic locations. Land surveyors with cloud-based project management offerings can help address this issue. When new information arises that changes the nature of a project, team members have one centralized portal they can upload that information to, and instantly ensure that everyone is able to see it. This removes the bottleneck involved with trying to make sure that everyone is on the same page. Land surveyors can also offer field teams the ability to access the project management system on mobile devices, so that new information can flow from job sites to offices as quickly as possible. For more information on land surveying services from Landpoint, read our oil and gas brochure, or request a free land surveying quote. Is It Time To Consider Another Professional Land Surveying Company? Loyalty between business partners is an admirable trait. Businesses depend on customer loyalty and the benefit to stable trading partners extends in both directions and usually result in a mutually beneficial relationship. One business provides a service that is important to the other while maintaining a high level of customer service. However, when times change and new technologies and practices emerge, if a professional land surveying company isn’t keeping up with it then it’s their clients who suffer. The standard technology for geodetic surveying was established in 1787 with the introduction of the Ramsden theodolite, and many land surveying companies – especially older land surveying companies – still use modified versions of the theodolite today as their primary means for data collection. A professional land surveying company that is still using this as their default method of surveying is generally not providing the best results for their clients. When the satellite-based Global Positioning System became fully operational in 1995, surveying changed significantly. Unlike ground-based data collection with theodolites, GPS data collection does not require line of sight visibility between measuring points. Professional land surveying no longer requires trekking to difficult locations to set up tripods. GPS measurements yield 3-D coordinates with high geodetic accuracy, and data can be collected around the clock without regard to weather. GPS surveys aren’t necessarily better than those made with conventional equipment, but they can often be completed more quickly. Graphic Information Systems took GPS land surveying data to another level by changing the way data is stored, retrieved and shared. Spatial coordinates and map features are stored as spatial data and can be organized into various map layers with common features. A survey is no longer just a paper map with line drawings of roads, easements and power lines. It becomes a collection of data layers that can be peeled back or added as desired. Additional information, called attributes, can be linked to the spatial data to give maps tremendous new abilities. Population demographics, political districts, school districts, fire districts and census data are all examples of attributes that are easily linked to spatial data. Maps can now be customized in amazing new ways. Many professional land surveying companies began using new GPS/GIS technology as soon as it had been proven accurate and reliable. Others felt that transit theodolites were sufficient for the work they were asked to perform and saw no reason to change. Both technologies work extremely well. Each has benefits in certain applications. For example, GPS surveys require an unobstructed view of the sky to receive satellite signals. They cannot be used underground, and mine surveys rely on theodolites. Mapping mountain ranges requires strenuous and dangerous climbing, and GPS mapping is both safer and convenient. The majority of applications, however, can be performed equally well by both technologies. The deciding factor is often how the data is to be handled. Energy companies are a good example of a business sector that often has a long-standing relationships with a professional surveying company. 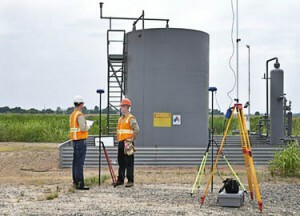 They continue to do business with the associated surveying company even though they know newer technology is available. So is the company losing opportunities because of these long-standing relationships? The answers depend on the level of service being provided and the company’s goals for using the data. Long term business relationships can lead to complacency. Long turnaround times become viewed as just a normal facet of the business when, in fact, GPS surveying can usually be completed much more quickly than standard theodolite surveying. Is time valuable to the project? In most cases, it is. Surveyors may have been providing standard paper surveys for decades, and these may have been sufficient for the needs of the company in the past. They may still be. But today businesses have to ask questions like “could the company benefit by knowing the demographics of the areas in which gas drilling or wind turbine construction is predicted to grow?” Companies should ask whether there are additional data needs or not. Is The Status Quo Good Enough For Your Company? There’s a lot to be said for company loyalty. There’s also a lot to be said in favor of growing and adapting to new business opportunities. Don’t be afraid to consider a new professional land surveying partner, especially if old relationships have grown stale. If you are looking for a change then Landpoint can help. Get a quote today and see how we can save your company both time and money. Many large projects rely on detailed, accurate maps. Landpoint understands the intricacies of creating accurate technical maps, and we leverage GIS technology to ensure the highest level of accuracy with the most complete sets of data. Read on to learn why GIS is one of the most important land surveying methods available to construction managers. Landpoint utilizes GIS mapping to capture, store, analyze and manage data with a spatial reference. This technology enables customers to better understand and analyze the data our field teams collect in a precise and efficient manner. The result is a faster turnaround time and more detailed project tracking planning for our clients. The data and maps we create with GIS mapping give our clients extensive levels of information that help manage projects at any stage. GIS mapping gives data analysis new dimensions by providing visual representation to even the most extensive sets of data, and this helps our clients make better, more informed decisions that allow them to come to the best outcomes for their project. Our GIS data and tools exist in the cloud. This means you can review your maps and survey results anywhere, including on your PC, tablet or phone. GIS dataset sizes are unlimited. You can populate as much data as needed. Our team has extensive experience in creating and managing GIS solutions for nearly any industry. We use GIS technology to fill a variety of needs, including site suitability modeling, infrastructure management, utility management, 3D visualization, geospatial data acquisition and creation, site selection and prioritization, cartographic services, real estate and business mapping, base mapping and more. To learn more about our land surveying methods and how we use GIS mapping in the oil and gas development industry, check out this demo. It shows the data we manage, including well locations, ownership, pipeline centerlines and pipeline right of ways.